Found this iPhone case on etsy... and I absolutely love it. In fact, the majority of tovicorrie's iPhone cases are awesome. 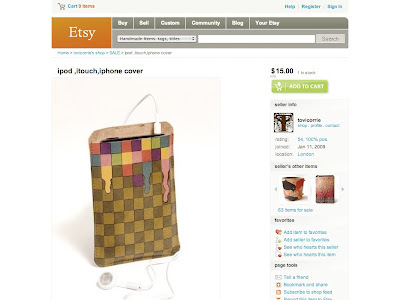 He makes cases for the iPod Classic & Touch, and the iPhone... using leather & suede to spoil your wee toy... with some vibrant designs on the front. Nice! In fact, I'd argue his designs are far better than the majority of cases in the Apple Store.